Steve Nagel and Alexis Nagel are the inventors, manufacturers, & marketers behind all UV Paqlite glow in the dark lights and UV Paqlite reusable glow sticks. This father-daughter business is dedicated to creating innovative lighting products and outdoor sporting goods that provide utility and sustainability using glow in the dark technology. They are inspired every day by Uncle Vernon, the "UV" in UV Paqlite. Read about Uncle Vernon's Story below. The "UV" stands for Uncle Vernon, the inspiration & motivation behind UVPaqlite’s products and Paqlite is a play on spelling for pack light. If you've had an Uncle Vernon in your life then you are familiar with the person who has taken it on as their personal responsibility to watch out for the entire family - and we mean the entire family to include sisters, brothers, nieces, nephews, grand nieces, grand nephews, and anyone else who spent a good amount of time with us. 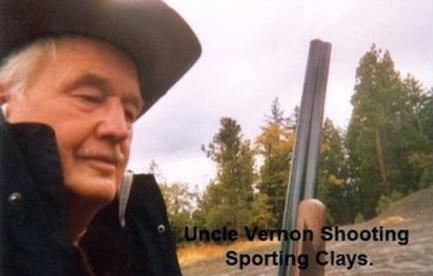 Uncle Vernon made sure everyone was prepared and safe as they can be for the outdoors. Our beloved Uncle Vernon grew up exploring the mountains of the Western U.S. hiking the many trails in Western Oregon, so he knew how fast the weather can change and how easy it is to get lost; or as he says "temporarily disoriented." In our family we all got our "Uncle Vernon Survival Kit" once we were licensed to drive. Uncle Vernon said, "When you go traveling, camping, hiking or just exploring the outdoors you need to be prepared. You need your flashlight with backup batteries and bulbs, you need your multi-tool or small tool set, safety reflectors, first aid kit, large knife, compass, ready to eat meals, and so on. Since you never know what can happen when you get out and about these days." Uncle Vernon was so instrumental in our family’s safety we wanted to lighten his load by coming up with lightweight, no fail light source for everyone’s safety. Uncle Vernon's Paqlite is the answer! It can be folded or rolled and comes in various sizes to fit your needs. If you explore the outdoors you know that the hikes can be long, you want to keep your back-pack light-weight, and you always want to be prepared. An unexpected night out in the dark can be unfamiliar and very uncomfortable, so why not take a light that is super lightweight, does not require batteries or bulbs, and has no parts to malfunction, will always provide light all night, can go in the water, and is environmentally friendly. A night light it is a welcome sight in any dark tent when you wake up trying to find your flashlight for your trip into nature in the middle of the night. Make your "Uncle Vernon" happy by taking an Uncle Vernon's Paqlite wherever that may be on our planet.